Our vacation started early morning. 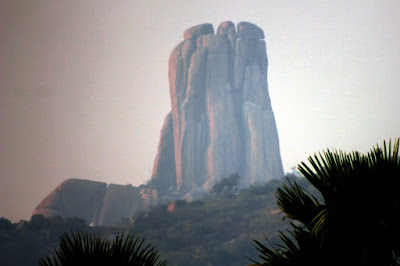 Our plan was to visit Nalagonda to see the Baobab tree on Balachandruni hill and the mysterious shadow of Chaya Someshwara temple. Then travel to Nagarjuna Sagar and reach Vijayapuri by 4 pm. We left home around 5-30 hoping to reach Nalagonda early. We took ORR, cruised nicely and for some reason we exited at Nagarjuna Sagar road instead of Vijayawada road. i realized the mistake near the first town by when we were some 10+ kilometers from ORR. Well, rather than turning back, we decided to take the inner roads towards Nalgonda. So we entered the remote regions of Telangana on a misty morning. The terrain was uneven, roads were twisty and narrow. Lot of farmland with toddy palm (Borassus flabellifer) along the boundaries. Cotton plants were plenty. We could see paddy saplings being grown for the upcoming season. 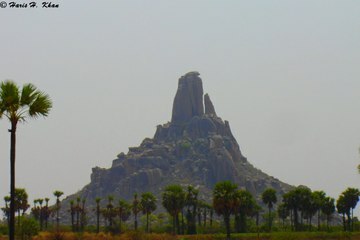 As we drove deeper, the terrain changed, we could hillocks with rock formations. Journey was slow because of poor road conditions. Around 8-30 a massive standing rock came into sight through the mist. It was a dark patch rising up from the horizon. The road went around the hills and we came to a point closest to the standing rock. It was still hazy when we took couple of shots. Here its is.. impressive isn't it? Here's another shot few minutes later. The standing rock has been marked as "Devil's Tower" in Wikimapia. Also, there might be a Sri Narasimha Swamy temple on or near the hill. 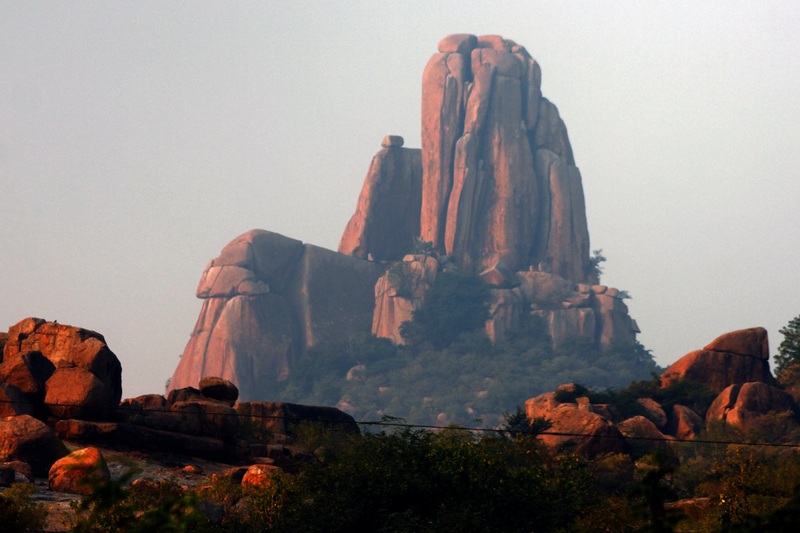 The hill is situated between Sivanna Gudam and Ram Reddy Palli. Here's the picture from Wikimapia. its an independent hill, meaning not part of a range. The rock has shot up and its approximately 100 meters / 330 feet high. After seeing the rocks location on the map, I realized there were roads going around the hill. Had I ventured another kilometer further I would have got great views of the peak. We are getting to know a lot by your exploration Sid. Keep it up. They look grand and elegant.